Like any good sci-fi/fantasy franchise, Star Wars has a number of its own unique cultures and languages, which serve to make the universe in which the stories are being told feel more fully fleshed-out, lived-in, and realistic. Also like any good sci-fi/fantasy franchise, Star Wars has superfans, scholars, and the like who can actually understand many of the languages being used in the films -- and, moments after today's teaser trailer for Star Wars: The Last Jedi arrived online, there were people trying to make sense of the Easter eggs, references, and hidden meanings behind some of the shots. One such expert is Donna Dickens, the Deputy Entertainment Editor at Uproxx, who knwos her Aurebesh. While it seemed the first bit of text she translated was basically just somebody mashing their fingers on the keyboard, Dickens went on to note that not all of the Aurebesh on the healing pod was gibberish. That's good news for fans of Finn, who was a major player in Star Wars: The Force Awakens but whose only shot in the trailer depicted him as in a kind of medical stasis. "It's been painful. It's been a process," actor John Boyega said of his character during a panel today at Star Wars Celebration Orlando. "Finn definitely stood up for himself at the end of The Force Awakens and caught a bit of an injury to his back. He will be back in The Last Jedi and he's not playing this time. " 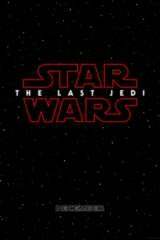 Star Wars: The Last Jedi is one of the most anticipated movies of 2017 worldwide, but how do our readers feel about it? Rate it on our Anticipation Rankings below and let your voice be heard!